The HRC is an international organisation made up of 47 governments, elected by the General Assembly in regional groups from all 193 United Nation States. The HRC, based in Geneva, Switzerland, sits in three regular sessions a year. It addresses broad human rights themes and assesses the human rights records of states with the aim to raise human rights standards and individual State performance worldwide. The HRC can call to account the most serious human rights violations through Special Procedures. Why is the UK seeking election to the HRC? The HRC is a vitally important international institution that we believe in and support. The UK has a central role to play in promoting and protecting human rights standards worldwide. 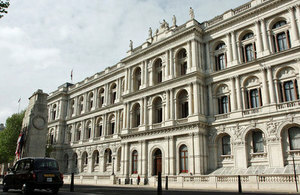 What does the UK bring to the HRC? Our publication Human Rights Council Elections - UK Candidacy gives more information about the UK’s candidacy for the HRC elections, our pledges and commitments to the HRC, and our record on promoting human rights worldwide. Find out more about the UK’s work on Human Rights. Read more about the Human Rights Council.